Thanks to the internet i was able to contact a man by the name of Victor Chapman who was stationed at Camp Wellfleet. 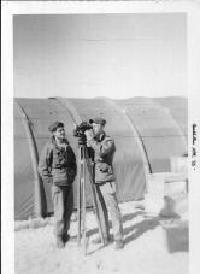 He has since provided me with information and photographs of the camp. I wanted to thank him so i sent him this nice display case (above) filled with Camp Wellfleet artifacts. The letter below is what he wrote back after receiving the items. I received the package today. Thank you again very much. When I left Cape Cod the last time in 1955 I planned to come back someday. I never did. I didn't think that Cape Cod would come to me! I talked to my son about the artifacts to be certain that they will have a suitable home when they blow Taps for me. I have some things that I had planned to give to the museum at Fort Bliss, Texas. Almost all Air Defense guys took their training there. Some people are trying to build a military museum in Houston. I will look it over before giving them anything.